P1263. 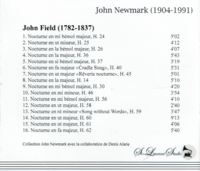 JOHN NEWMARK: John Field Recital. (Canada) St Laurent Studio YSL 33-437. [Exquisitely beautiful playing and phrasing here!] Transfers by Yves St Laurent. 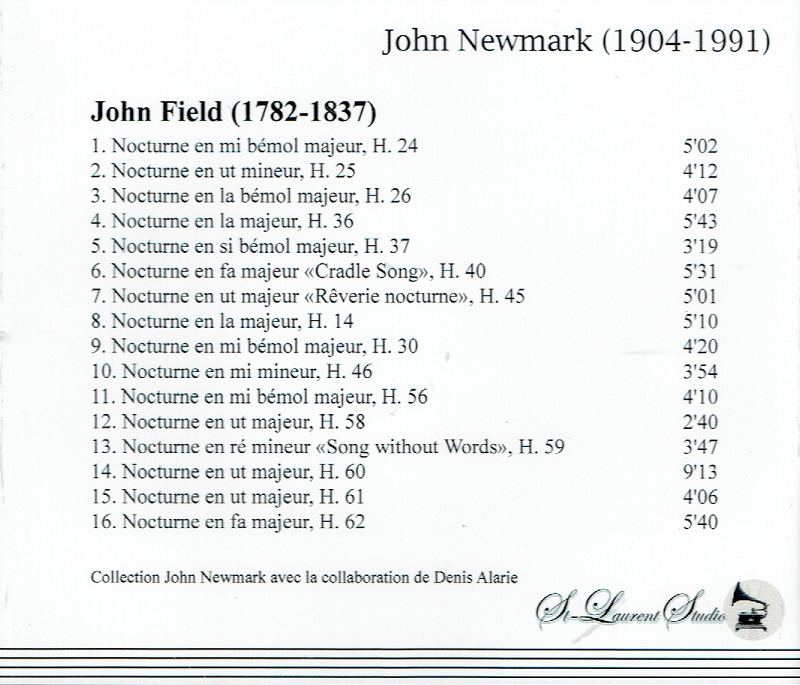 “John Newmark (Neumark) was a pianist, accompanist & chamber musician, born in Bremen, 12 June, 1904, then naturalized as a Canadian in 1946. 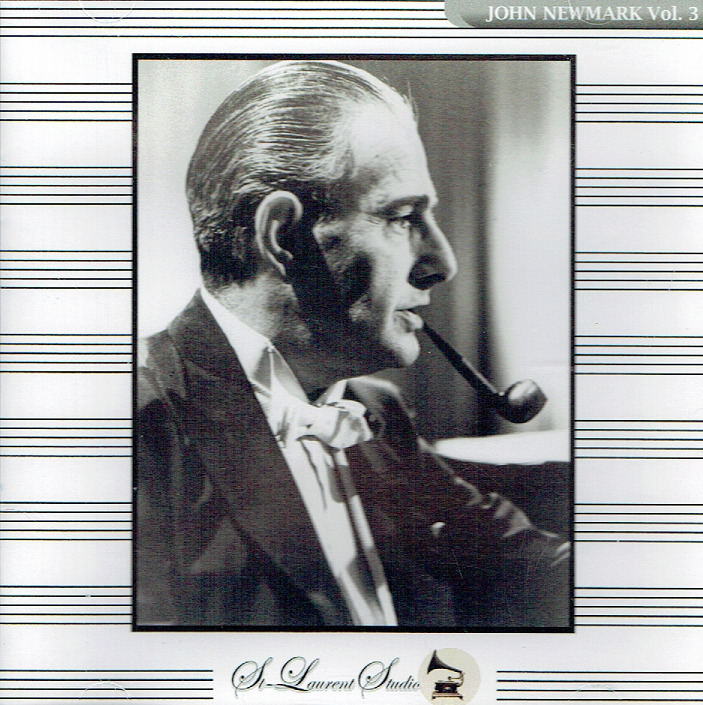 Newmark wanted to leave Germany, but it was not until 1939 that he was able to get to London. There he took part in concerts, notably with the soprano Emmy Heim and the violinist Max Rostal. In 1944 Newmark settled permanently in Montréal, where his services were soon in demand by eminent Canadian and foreign soloists. In 1949 he gave concerts in South America with Goldberg and accompanied Kathleen Ferrier on two extended tours of North America. With her, in 1950, he recorded song cycles of Schumann and Brahms for Decca-London & Brahms' ‘Vier Ernste Gesänge’. In 1952 he won a Grand prix du disque de l'Académie Charles-Cros. "John Field, the greatest Irish musical figure of the Romantic era, developed a highly influential keyboard style that provided a direct path to the music of Chopin. In contrast to his immediate predecessors, Field wrote music that calls for characteristically expressive and sensitive performance rather than virtuosic bravura. According to renowned and respected musicians like Spohr, Glinka, and Hummel, Field's playing was marked by a particular sweetness and delicacy and an emphasis on color and tasteful expressivity. Such qualities are reflected in Field's best-known and most influential compositions, primarily his nocturnes. At a time when piano music was typified by forms and genres like the sonata, theme and variations, fantasia, rondo, and fugue, the development of an independent composition emphasizing mood rather than thematic development or embellishment was both original and important. The development of the keyboard character piece paved the way for generations of Romantic composers, including Mendelssohn, Schumann, and Chopin, all of whom were indebted to Field. Field began his piano studies with his father, and later studied with Tommaso Giordani. He made his debut at the age of nine; in the following year, Field and his family moved to London, where the young musician was apprenticed to composer/piano manufacturer Muzio Clementi. On February 7, 1799, Field premiered his Piano Concerto #1; shortly afterward his apprenticeship with Clementi expired. For the next two years, Field was in demand as a soloist in London but continued to work for Clementi. Their relationship continued through 1803, when Field chose to remain in St. Petersburg after his appearance there during a tour. Spohr's autobiography suggests that Field was poorly treated by his former master, and St. Petersburg may have provided Field's first real opportunity to establish an independent career. Field, at any rate, lived in Russia for the rest of his life, achieving rather remarkable success as both pianist and composer. Shortly after his death his works faded into obscurity; today, however, his legacy as a seminal figure in Romantic piano composition is secure."